The most comprehensive and convincing sampled authentic Chinese instrument sounds in the world, in our opinion. Easy rack-based design. Comprehensive set of exotic sounds. Extenders enhance expression. Decent effects. Cheaper than the individual instruments. Silent default patch. Sometimes exhibits weird graphics bug. So-called 'world' or 'ethnic' sample collections have been proliferating ever since samplers first made it possible to play any sound as though it were an instrument. However, some virtual instrument collections are produced by people whose actual experience and knowledge of the real deal is low or next to nothing - if you're looking for a truly authentic experience, what's on offer can be disappointing, to say the least. "Kong's Chinee series of utterly convincing virtual instruments are tragically underappreciated"
For many years now, Kong Audio have been putting out truly authentic Chinese instruments, meticulously sampled from the real thing. 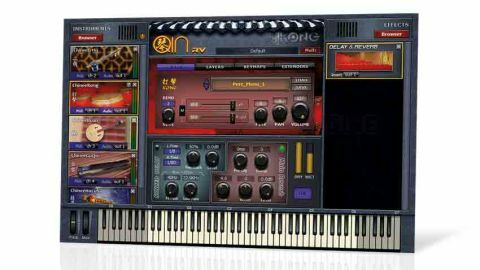 A Chinese company with a deep knowledge of traditional Chinese music, Kong's Chinee series of utterly convincing virtual instruments are tragically underappreciated, but its new Qin RV engine should make a good argument to the doubters. Built on a rack paradigm not unlike that seen in Kontakt, the multitimbral Qin RV plugin (VST) allows multiple instruments to be slotted in and played from any MIDI channel. Instruments occupy the left side of the GUI, editors are in the centre, and effects on the right. So what can you stick in these racks? Pretty much the entire Chinee Kong catalogue. Chinee Orchestra comprises 23 'instruments', though some of that number are actually made up of samples from multiple individual instruments. The sounds include Kong, a massive collection of percussion spanning two presets, each packed with five octaves worth of multisampled hits. A comprehensive selection of plucked and bowed instruments is here, too, along with the company's Chinee Winds collection. "The patches for each instrument are programmed with all the nuances and features needed to bring them to life"
The Chinee Orchestra collection does more than just hint at intriguing locales - it suggests a musical tradition with as much or more refinement and history than that of its Western counterpart. These instruments sing out with all the spit and grit of wood and string. Kong Audio has captured that history, and the patches for each instrument are programmed with all the nuances and features needed to bring them to life. For instance, velocity is sometimes used to switch between trills and sustained notes. Other patches provide keyswitching or other familiar sampler tricks to provide a realistic, convincing performance. While we can't go into every single detail of each instrument, we can reassure you that this is an outstanding and comprehensive collection. The Qin RV engine performs well, except for a minor graphical glitch. Our only real complaint is that the instruments load up with an initialised silent preset, requiring a couple of extra clicks to hear anything. While finishing this review, a new version arrived, featuring bridged 64-bit host support. The whole bundle has a pretty hefty pricetag of $690, though if you break it down, this equates to $30 per instrument. Not everyone will need to plump for the whole shebang. Curiosity seekers and dabblers might be better off buying the instruments individually (at $40 a pop), but composers of Chinese orchestral music, film soundtracks or game scores - not to mention new age types - will get more than their money's worth from this mighty package.